Gtrplyr1 wrote: Great suggestions ... I've heard great things about the original guitar chair .... then again Dirck ... where was that dumpster ? : ) Nothing like a bargain ! the dumpster was in Greeley, Colorado. Even if there arent any more chairs, it might be a good excuse for a road trip! I have back problems and after many attempts at finding a comfortable chair I've settled on a a straight back wooden chair, It is armless with a high back. I put a gel cushion (from a wheelchair) on the seat. I have a lumbar support ( it was meant to be used in a car - lightweight mesh) with a thick pillow behind it. It is not a pretty site but it is extremely comfortable. Traveller wrote: Here's a vote for the Original Guitar Chair. Well made, comfortable, and great support for your back. Dedicated chairs for musicians are sold as "orchestra" or "musician" chairs. They tend to have non-sloping or forward-sloping seats. Check out humaneguitarist (dot) org for info on why that is, and also for a few low-budget solutions. 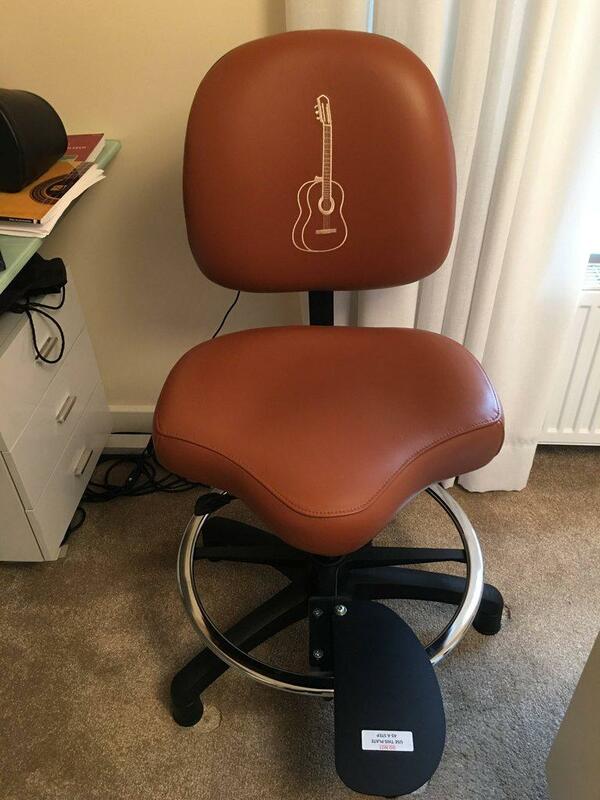 Ok ... think I'm going with the Original guitar chair ! Gtrplyr1 wrote: I'm interested in getting a dedicated guitar chair ... anyone have a good experience with one ? Here's the chair i got a few weeks ago. I'm very happy with it. Last edited by Iain on Thu Jan 28, 2016 9:51 pm, edited 4 times in total. I've made something similar from a plan I have. Very comfortable and fairly easy to build. If anyone is interested PM me with your email and I sent you the plan. About $40 worth of materials and a few hours time. I use a Gibraltar drum throne (9608). Easy to adjust the height, solid and comfortable. I've had the Original Guitar Chair for some time now and my lower back thanks me every time I sit and practice/play. The support I get on l my lower back is unsurpassed. The adjust right folding chair did not provide me with adequate back support. Mathew McAllister tried it when he stayed at my place and fell in love with it instantly. He went back to Scotland with one in his luggage! A bit expensive? Yes, but compared to the price of Chiropractors, the back pain and fixing distorted vertebrae, it's the best investment I could have possibly made for my guitar endeavors. I think I will try this option. My current stool gives me quite a square backside. Which is a shame given Allison Reynolds is a lovely lady who makes a fine product with her IP. Save up and buy the real thing. I love my two original guitar chairs. "Which is a shame given Allison Reynolds is a lovely lady who makes a fine product with her IP. Save up and buy the real thing." +1. This is a great product designed and built by Allison; I've never seen a bad review. I love mine. She's not exactly minting money on this. I've had mine for two years or so and it looks new; I use it daily.